This week I received my new eero mesh network. As I proceed to connect each mesh network node I'm measuring WiFi performance at multiple locations in my house and sharing the experience for the benefit of other potential mesh network adopters. Today I connected the second of my three eero units. 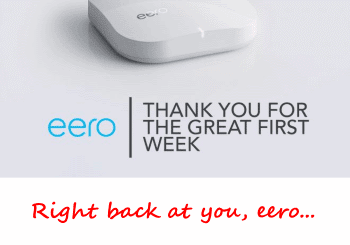 If you missed my "eero Day One" post click here to open it in a new window. Read the Day One post then continue below (I'll wait). How does a "WiFi mesh" work? A WiFi "mesh" is a collection of wireless access points supporting the same WiFi network (same SSID). The network coverage provided by cell phone towers is an excellent example of a mesh network. In theory a mesh treats every node as a true peer with no central / parent node. In practice this is rather difficult to do. What if you are streaming a video from a YouTube server and your mobile device moves too far away from node A and switches to using node B? The two nodes may agree to hand off responsibility for broadcasting your traffic to you but how does YouTube know to stream to node B instead of node A? One way is to use a common "mesh-aware" gateway to redirect the stream from node A to node B. A second, less scalable method is for each node to receive and then rebroadcast the signal to other nodes until the signal reaches the node connected to the mobile device. eero also does not treat all nodes as true peers. The eero node connected to your modem -- which, naturally, is upstream from anything else on your network -- is considered the "master" node. The master eero node decides how traffic is routed to all other eeros on the same WiFi network. The master eero is both a node and a gateway for other nodes. What is nice about this "combination gateway/node" design is that the hardware, software and features are the same for all eero units. If your primary eero ever fails you can simply swap in (and configure) any other eero unit to assume "master node" duties. What was my baseline again? In case you somehow still have not read my "eero Day One" post, my baseline is the D-Link 1000 Media Router the eero mesh network replaced. The aging $150 D-Link 1000 was quite the clearance-rack bargain at only $20 but it was only an average WiFi performer for its time. The second eero unit from my "eero three pack" was identical to the first -- every eero is the same hardware and software, remember? The only difference is that the first eero included an Ethernet cable while eero #2 and #3 did not. Instead of routing one port to my cable modem as I did for eero #1, I routed the port to a switch which was itself connected to port #2 of my "master" eero. Thus, my eeros are linked together via LAN cable which is the best configuration possible. If you don't have a wired LAN available you can instead connect multiple eeros together wirelessly which, as it happens, is what eero expects most users will do. I'll cover that option in the coming "eero Day 3" post. eero #2 was identical to "master node" eero #1.
and one for an optional switch or direct PC connection. eero #2 setup was effortless. You select the "Add eero" option in the mobile app, click "Next" a few times and you're done. Note that, as with eero #1, you must have the mobile app for initial setup and your mobile device must support Bluetooth LE as I discussed in "eero Day One". This is probably better described as "eero #1 + eero #2 results". eero #1 simply replaced my old WiFi router with a new WiFi router -- nice but no mesh. Adding the second eero actually created a mesh network. We expect the WiFi coverage area to be greater and we expect points close to the 2nd node to experience better bandwidth than before. If the two nodes aren't good at cooperating, though, they'll compete with each other and we could actually experience worse WiFi performance. I tested WiFi throughput from the same six points as before. Regarding my test results, bear in mind that I have basic Internet service which is capped at 50 Mbps download and 5 Mbps upload (although my maximum measured rates are a bit faster than that). My throughput measurements (below) are constrained by my service plan. You may get far better upload/download numbers on a faster Internet plan. Measured WiFi download rates in my home improved yet again with the addition of the second eero. I was concerned the two eeros might compete at points relatively close to both units but they worked flawlessly. Due to my Internet service plan's bandwidth caps I was hitting my download limits in some locations with the first eero by itself. Adding a second eero did not improve those already topped-out scores. However, points that were farther from eero #1 saw clear benefit from adding eero #2 and the wider mesh network coverage. The far bedroom (greatest interior distance from the cable modem) enjoyed the biggest leap from a low of 2.24 Mbps with the D-Link to a very healthy 42.64 Mbps with the 2-node eero mesh. As I did on Day One, I continued to measure Latency and Packet Loss but there were still no significant differences to report. I had 0% packet loss and latency times between 30 ms to 40 ms in all cases. 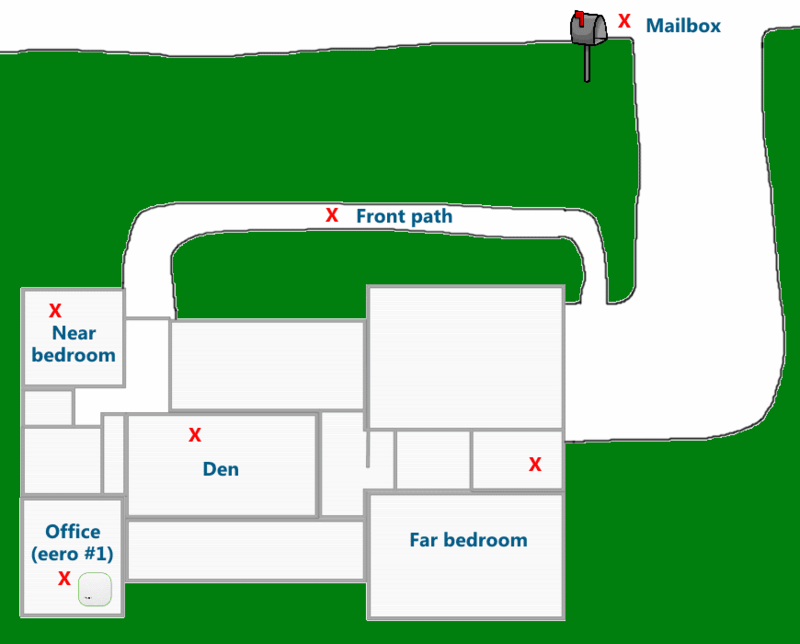 What will Day Three and the addition of the final eero do for my home WiFi network? Based on the Day Two results I'm hoping to see all interior areas of my house providing maximum WiFi bandwidth right up to my current Internet plan's limits. Given the expanded WiFi coverage and improved performance the 2-node network is already providing, I may need to start keeping an eye out for potential WiFi squatters parked near my mailbox. In the "Day Three" post I'll summarize what's cool and run down some things I believe eero needs to improve upon. Do you have eero or a competing consumer WiFi mesh product? Comment below to share your experience and recommendations!